In1986 Bill Courtney invented an elastic fluid for absorbing the energy of violent impacts and vibration. He referred to his invention as Shock Absorbing Liquid (SALi) Technology. After saving up for ten years he patented his invention and enrolled as a mature mechanical engineering student at Manchester University. He handed over SALi marketing to the University and signed a 50:50 royalty sharing agreement with it. His University status rose rapidly when he gained media attention and attracted £300,000 of public funding for University research into SALi. The bulk of the money went towards developing a new type of pedestrian friendly car bumper to meet pending EU legislative requirements. Unfortunately, Bill’s research supervisor resented being overshadowed by Bill. So he created false evidence “proving” that SALi inventions were ineffective. This fraud squandered the public funding plus Bill’s personal investment of £140,000. It may also have cost European pedestrian lives. Eventually, the SALi patents ran out, development ceased and the EU legislation was withdrawn. After five years of lobbying and winning the support of a Nobel Prize winner, a Formal Enquiry into Bill’s complaints about research fraud was finally held. The Enquiry Panel consisted of two Manchester University Professors and a representative of the UK Research Integrity Office. Their report cleared Bill’s supervisor of any wrongdoing, but castigated Bill for making a groundless complaint. In order to reach this conclusion the Enquiry Panel had to ignore the evidence as submitted via the Nobel Laureate and replace it with false evidence that in some cases was so bizarre that it defied the basic laws of physics. You can judge this case for yourself by reading the article below. He refers to this invention using the trade name Shock Absorbing Liquid (SALi) TechnologyTM. Figure 1. The essential features of a SALi based impact energy absorber. 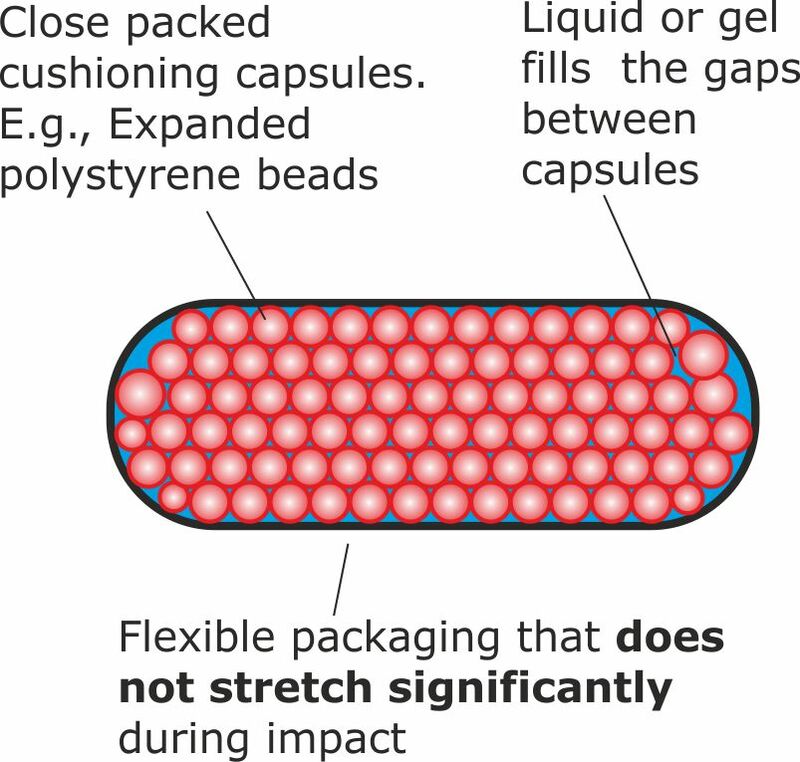 Early research verified that for effective impact protection, stretching of the packaging during an impact must be minimal. This evidence was presented in a journal paper written by Courtney and his research supervisor, Dr Oyadiji, in 2001 . SALi based impact absorbers can described as ‘smart’ devices because they can vary their stiffness to maximise their protection for different types of impact. For example, a hollow car bumper filled with packages of SALi could solve the “conflict of stiffness problem”. That is, it would be stiff for impacts with other vehicles, but soft for collisions with humans. This variable stiffness would keep minor crash repair costs down while minimising pedestrian accident injuries. 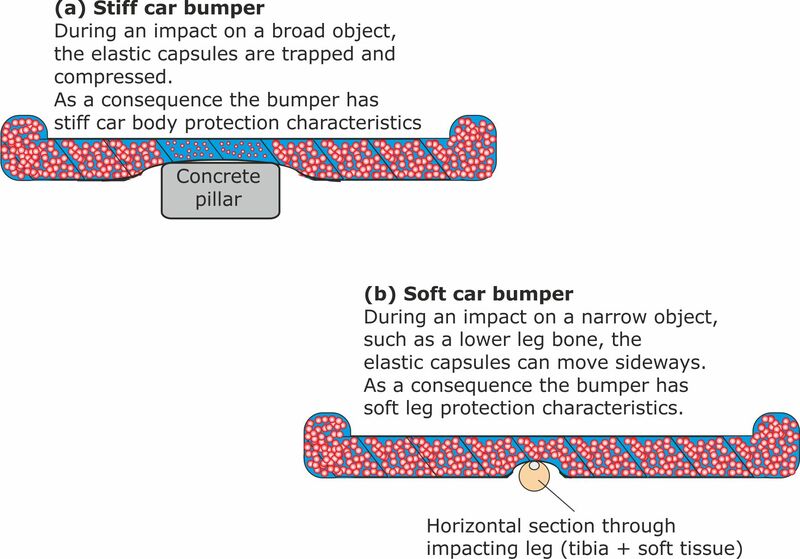 The following diagrams represent horizontal cross sections through a SALi filled bumper under different types of impact. The SALi is held in overlapping low stretch bags. Figure 2. A variable stiffness car bumper. The bumper is extra-soft for collisions with children’s legs, because they have narrower tibia bones. Supporting experimental evidence was published by Courtney and his research supervisor, Dr Oyadiji in 2001 . After saving up for ten years, Bill Courtney enrolled as a mature mechanical engineering research student at Manchester University. Later he went on to become a self funding University Research Fellow. 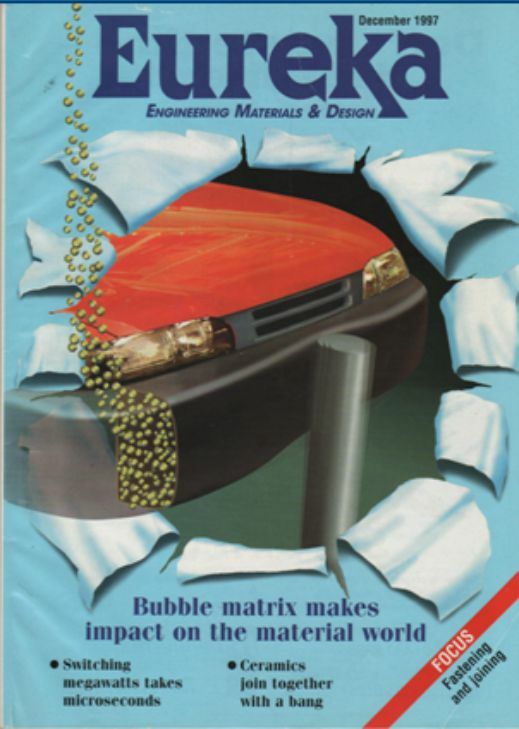 Bill’s smart bumper designs received several write-ups in the engineering press, arousing the interest of the Auto Division of Dow Chemicals (which made car bumpers).The reason for Dow’s interest was that the EU had published a draft directive requiring all new cars sold into European markets from 2005 onwards to have soft pedestrian friendly front bumpers. But the manufacturers wanted to retain stiff bumpers because they feared that car sales would suffer if the cost of repairing minor impact damage increased. Bill’s variable stiffness bumper design had the potential to keep everyone happy. So Dow teamed up with Bill’s company, Cheshire Innovation, and Manchester University to create the PedSALi Project to build a demonstration smart bumper. The University was awarded £212,000 to pay for their PedSALi research. Bill seemed to be on the verge of becoming a millionaire as a result of this collaboration. However, as an inventor, he was more interested in developing inventions that benefited humanity than becoming rich. In spite of this, Bill’s university research supervisor (Dr Sunday Oyadiji) became unhappy about Bill’s pending fame and fortune. This resentment deepened after Bill voluntarily signed a 50:50 royalty sharing agreement with the university. Eventually Dr Michele Cooper, the team leader for the SALi marketing group at the university, banned Dr Oyadiji from her marketing meetings because of his disruptive behaviour. Shortly after his ban, Dr Oyadiji steered the car bumper research in a false direction by using elastic packaging that rendered the SALi material ineffective. In spite of protests from both the Dow representative and Bill, he went on to present these false results at two engineering conferences in the USA [11, 12, 13]. The University research results were completely useless to Dow and the collaboration collapsed. A report written by Dr Oyadiji and his line manager, Professor Wright, falsely informed the research funding body (EPSRC) that Dow had examined the University research results and concluded that the SALi filled bumper would not work. The University was paid in full for its corrupt research and Dr Oyadiji was promoted from Lecturer to Reader in the following years. There was no other solution to the conflict of stiffness problem. So the EU abandoned its draft directive in February 2003. However, it did not abandon its pedestrian interests completely, planning to implement the soft bumper requirements in 2012, if the technical problems could be solved. The business arm of the University had seen this collapse coming. As a backup, it proposed developing other commercial applications of SALi that could earn a royalty income. But experimental evidence was needed to support the marketing drive. So Bill agreed to Dr Cooper’s suggestion that additional research should be done using DTI SMART funding, with Bill holding the purse strings, instead of his supervisor. The planned CrashSALi research was broad based, varying from vehicle crash protection to SALi based car suspension units. Although he owned the SALi patents and had spent his £140,000 retirement savings on them, he lost control of them because he had handed over royalty negotiating rights to the University. Fig 4. Extract from the royalty sharing agreement signed with MIL, the business arm of Manchester University. As part of the agreement, MIL took control of the royalty negotiating rights. In 2008, Dr H Davies, an enterprising academic engineer at Cardiff University took an interest in the SALi concept. An incidental benefit of the Cardiff University interest was the production of valid SALi research results that could be compared with the fraudulent research done at Manchester University. (i) CrashSALi fraud exposed: Under Dr Davies supervision, Cardiff University, students carried out the basic CrashSALi research correctly. Their work was good but very limited because it was unfunded. 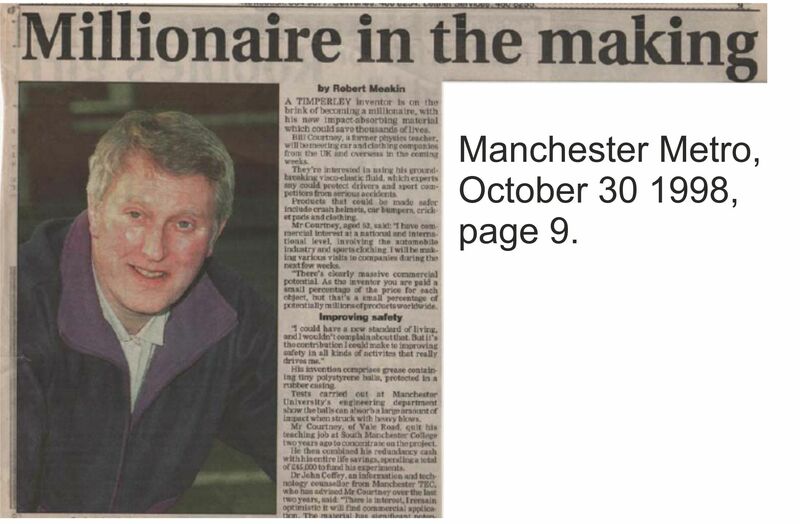 (ii) PedSALi fraud exposed: Dr Dr Davies’s students also produced replication evidence that exposed the Manchester PedSALi research fraud. His students also carried out good basic research into SALi based variable stiffness car bumpers. This work was published at an engineering conference in 2009 . Likewise, the good Cardiff research exposed the Manchester PedSALi research fraud. In order to do more detailed work Dr Davies needed to win EPSRC funding. This would require the fraudulent Manchester University SALi research to be retracted and the dishonestly earned PedSALi grant repaid. After five years of lobbying and winning the support of a Nobel Prize winner, Professor Sir John Sulston, Manchester University finally agreed to investigate Bill’s complaints. This Inquiry took place in line with procedures laid down by the UKRIO. Following a preliminary investigation carried out by two Manchester University academics and Professor Farthing, a UKRIO trustee, the inquiry moved to the Formal Investigation stage. This is where the corruption began. We tell the story of the Formal Enquiry corruption in detail on our PedSALi page. Here we will discuss one small extract from the report, to give you a taste of the unprofessional behaviour of the report writers. The report was written by Professors Helen Gleeson and Peter Duck of Manchester University and Dr Pablo Fernandez of the UKRIO Advisory Board. The following extract reveals how the report was worded so that the reader would be fooled into thinking that Bill Courtney was an incompetent inventor and Manchester University was the victim of his foolishness. To the innocent eye, this extract appears to provide clear evidence that Bill Courtney was incompetent and that a panel of expert engineers had exposed him. We will now consider this statement a phrase at a time, to show how the reader has been deceived. This claim is false and makes Mr Courtney look stupid by research engineering standards because such a material would defy the basic laws of physics. This lie is the polar opposite of the promotional claims agreed by both Courtney and the business arm of Manchester University in their agreed marketing literature. There is no such thing as an ideal shock absorbing material stress/stain curve. For example, a SALi filled car bumper can exhibit a range of diferent stress/strain curves depending on what the bumper is hitting. For car bumper impacts with other vehicles, a very steep stress/stain curve indicating a stiff material is required. For adult leg impacts, a gentle curve indicating a soft material is required. For child leg impacts, an even gentler curve indicating a very soft material is required. the promotion of SALi Technology was being led by a four strong University marketing team, not Mr Courtney. This inconvenient truth was buried by failing to mention the royalty sharing agreement in the report and ignoring Mr Courtney’s recommendation that Dr Michele Cooper, the marketing team leader, should be interviewed. “Mr Courtney …………stated that there were indications that SALi behaves like that. Mr Courtney had stated no such thing. In fact his experimental evidence [reproduced on the PedSALi page] demonstrated the variable stiffness properties of SALi based impact absorbers. This is what had attracted Dow Chemicals interest and won public funding for the PedSALi project. (i) One of the members of the supposed Technical Committee, Dr Oyadiji, was a aware that this ‘statement by Courtney’ was false because it contradicted what Courtney and Oyadiji had written in a joint journal paper . (ii) A second member of the supposed Technical Committee, Professor Wright was also aware that that this ‘statement by Courtney’ was false because it contradicted statements made in the joint bid for PedSALi research funding made by Oyadiji, Wright and Courtney. This statement seriously misleads the reader because the research carried out at both Cardiff and Nanjing Universities had used displacement sensors. Copies of relevant papers published by both Cardiff and Nanjing Universities was submitted to the Inquiry [4, 5]. But the valid SALi research done at Cardiff and Nanjing Universities is not referred to in the Formal Enquiry Report. This omission of key evidence sidesteps one of the basic tests for scientific integrity: good quality research can be replicated. This was a particularly brazen and easily exposed lie. (i) In spite of several requests to Manchester University using the Freedom of Information Act, no traces of this Technical Committee can be found. There are no meeting minutes, no recorded meeting dates and no email references to such a Committee. (ii) As explained on the PedSALi page, three of the named members, Professor Wright, Dr John Turner and Dr Oyadiji were heavily involved in the earlier publication of the corrupt SALi research. (iii) Dr Xinqun Zhu was the first research assistant for the PedSALi project. He had resigned and gone home to China almost two years earlier following lack of University support during some very unsettling experiences. (iv) Dr Eugenio Toccalino was a Dow Chemicals employee. His written denial of membership of the committee is reproduced on this linked page. Manchester University and the UKRIO are conveniently hiding behind each other in a manner that shows contempt for genuine research integerity. Professor Luke Georgiou, the Vice President for Research and Innovation at Manchester University, has refused to examine Courtney’s evidence of Enquiry Panel fraud. He claims that the Panel’s Report is quality control guaranteed because the Panel included a UKRIO member. On the other hand, James Parry, the Director of the UKRIO has said that it will investigate Courtney’s complaints, but only if Manchester University requests it to do so. The UKRIO is funded by British Universities. So it has a vested interest in humoring them. Each page of the formal inquiry report that Courtney received was marked “Private and Confidential”. Nor should its trustees be willing to collude in refusing to investigate allegations of false information within the report. Courtney has not been able to gain access to the thinking of the trustees on hiding fraud because the UKRIO is exempt from the Freedom of Information Act. In an age when fake news is destroying trust in public life British science needs to set an example by offering higher standards of openness and integrity. Several universities in the UK possess the required turbine design skills and when approached, each initially agreed to work with him. This has resulted in visits to the universities for detailed discussions. But for some reason, after a few weeks of planning joint work, communications are cut off. The most likely explanation for this abrupt cooling of interest is unease at Bill’s activities as a research fraud whistleblower. Bill and his Latent Power Turbines Ltd business partner are patriotic Brits, but they have now been driven to seeking a partnership with an overseas university. 1 Courtney, W. A. Preliminary investigations into the mechanical properties and potential applications of a novel shock absorbing liquid, MPhil Thesis, Manchester School of Engineering, University of Manchester (1998). 2 Courtney W A and Oyadiji S O (2001). Preliminary investigations into the mechanical properties of a novel shock absorbing elastomeric composite. Journal of Materials Processing Technology 119 (2001) 379-386. 3 Courtney W A and Oyadiji S O (2000). Characteristics and potential applications of a novel shock absorbing elastomeric composite for enhanced crashworthiness. International Journal of Crashworthiness 5:4 (2000) 469-490. 4 Huw Davies et. al., Cardiff University School of Engineering, Pedestrian Protection using a Shock Absorbing Liquid (SALi) based Bumper System, ESV Conference, Stuttgart, June 2009, Paper Number 09-002. 6 Courtney, W .A. Device incorporating elastic fluids and viscous damping, World Intellectual Property Organisation, WO 97/25551 (1997).Subsequently granted as GB2324352. 7 Courtney, W. A. Improved impact absorber with viscous damping, World Intellectual Property Organisation, PCT/GB98/03594 (1998).Subsequently granted in the UK, Germany and France as EP (UK) 1068460. 8 Courtney, W. A. Impact absorbent building structures, British Intellectual Property Office GB9805887.8 (1998).Subsequently granted as GB2335447. 9 Courtney, W. A. Impact energy absorbing device incorporating bunching capsules British Intellectual Property Office, GB0907996 3 (2009).Subsequently granted as GB2470180. 10 Courtney, W.A. Improved vibration isolator, British Intellectual Property Office GB0915807.2 (2009). 11 Oyadiji, S O., et. al., University of Manchester, Core property characterization for a shock absorbing composite, SAVIAC 75th Symposium, 17-22 October 2004. 13 Georgiades. G, et. al., Impact response of flexible cylindrical tubes filled with a shock absorbing composite, University of Manchester, SPIE Conference 7-10 March 2005. 14 G. Georgiades. G., et. al., University of Manchester, Characterization of the Core Properties of a Shock Absorbing Composite, Journal of Engineering Materials and Technology, ASME, October 2007, Vol. 129, pages 497-504.